It's less about self-promotion and more about self-discovery. Frida Kahlo's "Self Portrait with Monkeys" -- the equivalent of a modern selfie. In our current selfie-obsessed society there's a glaring gap between fabrication and reality. Individuals are diverted from the true benefits of self-expression as people are more preoccupied with society's standards than adhering to their own personal standards. Passions are cast aside in favour of the latest trend. Art is a useful tool in reminding us of the true purpose of self-representation--self discovery and exploration. Acclaimed Mexican artist Frida Kahlo was largely a performer throughout her career, staging herself in different visual settings to portray key moments in her life as an artist, lover and woman with pervasive physical ailments. 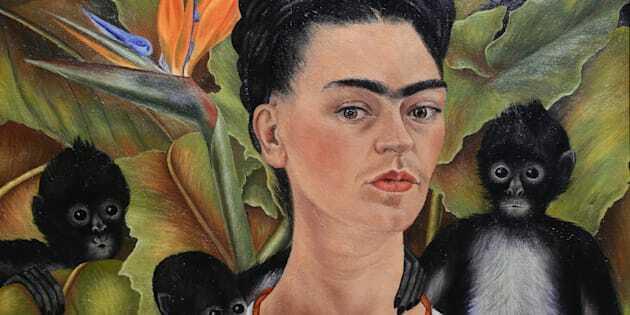 But unlike our selfie-obsession, Kahlo's use of magical realism and fantasy was in the pursuit of exploring her true self, not an attempt to mask it. Frida's raw self-representation is relevant today as we are living in a moment of heightened vanity and narcissism. There is such an onus on the virtual world that real emotion, the importance of self-awareness and inner feelings, become lost in a flurry of images and feeds. Artists like Kahlo should be the pin-up girl for modern women looking to express themselves, or at the very least serve as a reminder that the image of perfection is unrealistic and, to be frank, quite boring. "Henry Ford Hospital" by Frida Kahlo. Kahlo's portrayal of her miscarriage is one of her most well-known works and also one of the most visually powerful in its portrayal of the female reproductive system. Kahlo lies on the bed, her insides literally falling out as she grieves the loss of her child. Kahlo's's depiction of herself as a grieving woman in pain was one of the first of its kind and was an objection to the false portrayal of women in nudist paintings where they were positioned merely as objects of desire. Women today are often exposed to the sort of 'nudist' type imagery that prompted Kahlo's desire to turn this image of the female body on its head. The bikini-body image permeates Facebook and Instagram and is a superficial portrayal of the female body. Kahlo's raw and open depiction reflects a more gruesome and painful side of a woman's body. A depiction that I am sure many women can relate to. "The Two Fridas" by Frida Kahlo. This painting has been argued to explore Kahlo's hybrid identity, as her father was German and her mother was a mix of Spanish and indigenous Mexican descent. The notion of hybrid identity is particularly relevant to today's globalised and fast-paced world. With the advent of global travel, women can identify with and feel a sense of belonging to multiple cultures. Kahlo's depiction of her two selves can relate to the distinction between public and private life. Who we feel we represent in our careers and in our personal lives can coincide in many ways, but can also differ greatly. Kahlo's painting is useful in highlighting the complexities of balancing and navigating multiple identities and versions of oneself. "Self Portrait as a Tehuana" by Frida Kahlo. Kahlo's deep connection with her surroundings and nature was vital to her artwork and is something that can be easy to lose sight of in the chaos of the day-to-day. Kahlo often likened the female body and her relationships to nature, illustrating the soothing function that nature can have on our lives and mentality if we take the time to stop and be aware of our surroundings. Time spent among nature can offset the drain of hours spent replying to emails or browsing our various feeds. In Alain de Botton's book Art As Therapy, art is described as a tool that helps remedy the psychological frailties that characterise modern life. He states, "art compensates us for certain inborn weaknesses, in this case of the mind rather than the body, weaknesses we can refer to as psychological frailties". Kahlo's artworks are the perfect antidote to the sometimes poisonous images on Instagram and our natural inclination for constant self-comparison in favour of deeper self-discovery. If we remove the need for perfection, self-expression can be enjoyable, creative, cathartic, and bring us joy and relief as opposed to angst and anxiety.